This challenge gave us a JAR. 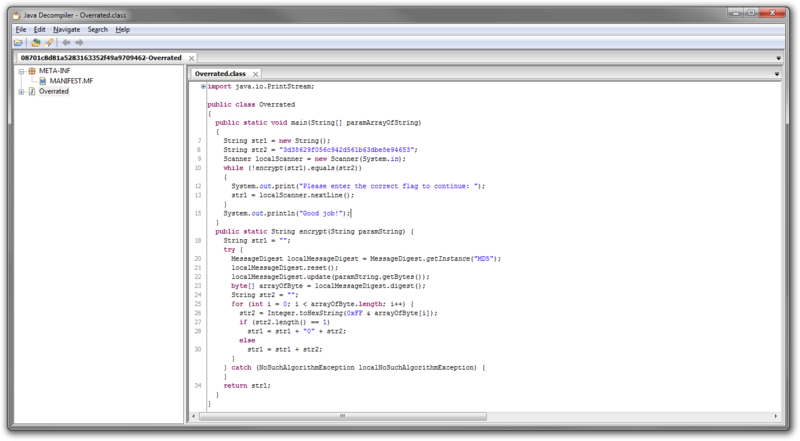 We extracted it, and opened the class in JDGUI. It’s immediately clear that this challenge is to brute force an MD5. The manifest file gives us the first 6 characters, and leaves us to brute force the last 6. We know the keyspace is 0-9 A-F, as previous challenge flags fit that format. So, we modify this to brute force the 6 characters and we’re done! Since the main challenge here is brute forcing, this is really more of a crypto challenge than it is a binary challenge.